this issue is not related to MCPE-12516. it is a baby chicken only bug. if it were related to MCPE-12516, then it wouldn't exist! 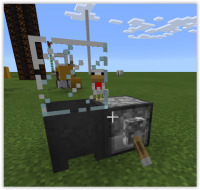 it is still in 0.15.6.
set out a dispenser with a lever. set a cauldron next to it's output and cover it with something like a carpet. put spawn eggs in the dispenser. 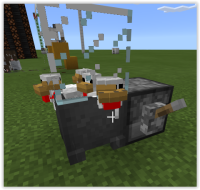 if the egg spawns an adult, it will stay in the cauldron. if it spawns a baby, the baby will jump out over the carpet. if you were to put lava over the cauldron so that when the baby grew it would be cooked, it doesn't work because the baby always jumps up immediately and dies. MCPE-12516 Items and yourself cannot fall into cauldrons.